In the late 50's, Father George Papadeas saw the need for a companion book to The Beautiful Orthodox Holy Week and Pascha Services. Father George embarked on the mission of creating this book for the burgeoning Greek-American Orthodox Communities. In 1963, after many years of intense analysis and compilation, Fr. George successfully completed the very first Greek Orthodox Holy Week and Easter Book with a New English Translation. Father George later created Patmos Press to distribute his new religious book. 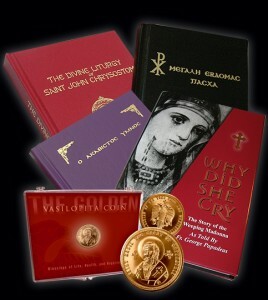 Then as now, “Holy Week Easter” became known as the Gold Standard companion book for Orthodox Holy Week Services. In 2006, Holy Week Easter was revised and updated. In 1968, Father George compiled "The Divine Liturgy of St. John The Chrysostom". With this book, The Greek American Faithful were introduced to an easy to follow book that helps the Parishioner appreciate The Beauty of The Liturgy and helps them to participate more readily. This book has also become a widely used Standard found in the pews of Orthodox Churches worldwide. In addition to "The Akathist Hymn" and "Why did She Cry" by Father George, Patmos Press will be bringing you more Orthodoxy in the future. Such as the Tradition of The vasilopita Coin, including it's history as well as our Favorite vasilopita Recipe.